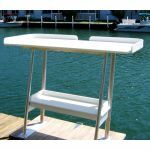 King Starboard Fish Cleaning Station Table Top Only -- 54" Long X 23+" Deep. Man has searched for the ideal fish cleaning table almost from the beginning of recorded history. This lack of the perfect place for filleting fish has always nagged at me, like an important chore left undone. So I decided Buck Woodcraft would design and manufacture a fish cleaning table that combines style with the practicality and endurance required of any serious dock accessory. A fish cleaning station that can live happily outside year after year--enduring rain, sun, salt, snow, seagull poop, and the dark of night without needing maintenance. In short, a fish cleaning table for the ages.